Here we show a retail store with a high customer count at lunchtime but associated with a relatively short average dwell time (typical of lunchtime trade), however the store is clearly busiest (highest occupancy) between the hours of 5pm to 7:30pm when traffic is lower but the average dwell time has increased. Assuming that conversion ratio is impacted by the staff to customer (SC) ratio (stores with a poor SC ratio will perform worse than stores with a higher SC ratio) then maintaining staffing levels during periods of high occupancy – hence maximising SC ratio during these times will, in turn, maximise the average daily conversion ratio. Combine this with the reality that customers dwelling longer are likely to buy more leads to the conclusion that for optimum store performance increased staffing levels should not only be used in periods of high traffic but also in periods of high occupancy. So why has an occupancy metric never been available before? The explanation is simple – people counter accuracy. The accuracy provided by the current generation of people counters typically sits between 95%-98% depending on many factors such as environmental conditions, lighting and installation quality. Even at the 98% accuracy point, the accumulated error between the in count and the out count can rapidly rise to a point where it is of similar magnitude to the actual occupancy making the metric next to useless. Recent improvements in people counting technology, such as the Irisys Vector 4D device have seen in / out count accuracy improve to >99%, however even at these levels the accumulated error can be distracting. 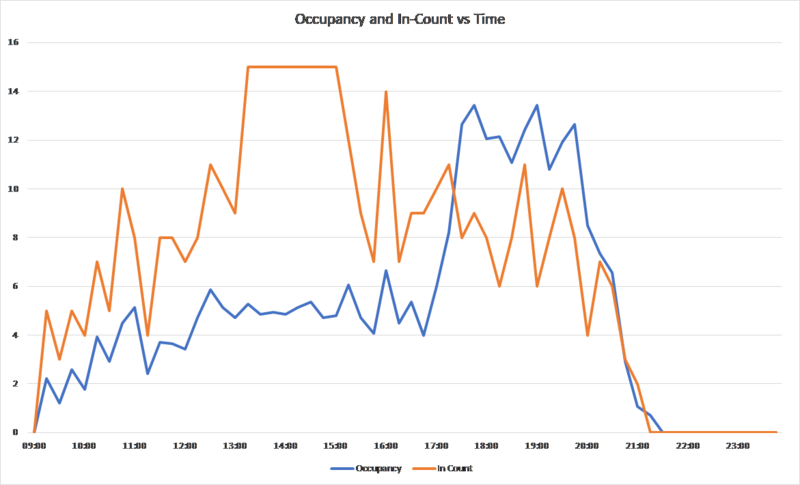 To correct for these errors and provide the highest accuracy occupancy figures, an end of day occupancy correction algorithm must be used to remove accumulated errors in a statistically optimal fashion. Irisys have developed such an algorithm which combined with the high native accuracy of the Vector 4D product now provides retailers with insight into this highly valuable metric.